Amazon’s future delivery service, Prime Air, promises to “safely get packages to customers in 30 minutes or less using small unmanned aerial vehicles, also called drones.” Amazon states that Prime Air will only be released once they “have the regulatory support needed to realize [their] vision.” This is referring to the recent regulations published by the Federal Aviation Administration (FAA) regarding the use of Small Unmanned Aircraft. Part 107 of the FAA Regulations addresses commercial uses for drones weighing less than 55 pounds. These regulations prohibit the use of any unmanned aircraft that are outside the “visual line of sight,” or VLOS, of the remote pilot in command and the operator of the drone. Additionally, the FAA regulation requires the drone to remain close enough to the operator and pilot that the aircraft may be seen “with vision unaided by any device other than corrective lenses,” meaning without the use of visual aids such as binoculars. The regulation states that these restrictions may be waived if proven that the drone may be operated safely “under the terms of a certificate of waiver.” Clearly, these regulations are a significant obstacle to Amazon Prime Air, as they prevent the operation of drones without a visual line of sight, essentially barring drone deliveries outside of a 10-mile radius. While this news was challenging for the future of Amazon Prime Air, not all hope is lost. In August 2016, the FAA granted the first exemption to the “Visual Line of Sight” provision in Part 107, granting Precision Hawk, an agricultural drone company, the ability to fly drones outside the visual line of sight of the remote pilot. The FAA’s exemption for Precision Hawk’s drones could be a step in the right direction toward unmanned aircraft delivery services such as Amazon Prime Air. Despite the regulatory hurdle imposed by the FAA, Amazon announced in July 2016 that it would soon begin testing drone delivery services in the United Kingdom. 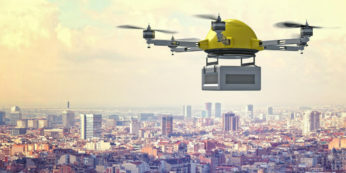 The United Kingdom’s Civil Aviation Authority (CAA) has granted Amazon permission to “test the drones when they are out of sight from operators, measure their ability to identify and avoid obstacles and gauge the success of operators flying multiple drones at once.” Supporters hoped that the success of these tests would put pressure on the FAA to amend their regulations to allow for drone delivery services to operate out of the visual line of sight. In August 2016, the FAA granted Alphabet’s Project Wing the permission to begin testing drone deliveries beyond the line of sight in one of six FAA-approved testing locations. While there are signs of progress, Amazon and Alphabet still face regulatory challenges in the United States. For now, consumers in the United States will have to wait a little longer before drone deliveries become an every day reality. See Ben Popper, Alphabet Will Begin Testing Its Delivery Drones Inside the U.S., The Verge (Aug. 2, 2016, 1:19 PM), http://www.theverge.com/2016/8/2/12353788/google-autonomous-drone-project-wing-faa-approved-test. See Troy A. Rule, Airspace in an Age of Drones, 95 B.U. L. Rev. 155, 157-161 (2015); see also Martyn Williams, New FAA Rules Mean You Won’t Get Amazon Drone Delivery Anytime Soon, PC World (June 21, 2016, 9:00 AM), http://www.pcworld.com/article/3086790/legal/new-faa-rules-mean-you-wont-get-amazon-drone-delivery-anytime-soon.html. See Rule, supra note 2, at 160. See David Z. Morris, Top Amazon Exec Says U.S. Rules Could Delay Drone Delivery, Fortune (Jan. 19, 2016, 2:00 PM), http://fortune.com/2016/01/19/amazon-drone-delivery-delay/. See Adario Strange, 3 Challenges Keeping Amazon’s Delivery Drones From Taking Flight, Mashable (Dec. 1, 2015, 2:46 PM), http://mashable.com/2015/11/30/amazon-prime-air-reality/#Ih1ZzM9fakqR. See Amazon Prime Air, https://www.amazon.com/b?node=8037720011 (last visited Oct. 21, 2016). See 14 C.F.R. § 107 (2016), http://www.faa.gov/uas/media/Part_107_Summary.pdf. See id. at § 107.31(Visual line-of-sight (VLOS) only; the unmanned aircraft must remain within VLOS of the remote pilot in command and the person manipulating the flight controls of the small UAS. Alternatively, the unmanned aircraft must remain within VLOS of the visual observer.”). See Waiver Policy and Requirements, 14 C.F.R. § 107.200 (2016). See Luke Johnson, 9 Things You Need to Know About the Amazon Prime Air Drone Delivery Service, Digital Spy (July 26, 2016), http://www.digitalspy.com/tech/feature/a775701/9-things-you-need-to-know-about-the-amazon-prime-air-drone-delivery-service/. See BI Intelligence, The FAA has Granted a Major Drone Exemption to This One Company, Business Insider (Aug. 31, 2016, 2:02 PM), http://www.businessinsider.com/faa-grants-drone-exemption-to-precisionhawk-2016-8; see also Lora Kolodny, In a First, FAA Allows PrecisionHawk to Fly Drones Where Pilots Can’t See Them, TechCrunch (Aug. 29, 2016), https://techcrunch.com/2016/08/29/in-a-first-faa-allows-precisionhawk-to-fly-drones-where-pilots-cant-see-them/. See Gwen Ackerman, Amazon Partners With U.K. to Test Deliveries by Aerial Drone, Bloomberg (July 26, 2016, 6:17 AM), https://www.bloomberg.com/news/articles/2016-07-26/amazon-partners-with-u-k-government-to-test-delivery-by-drone. See Cecelia Kang, Amazon Expands Drone Testing in Britain, New York Times (July 25, 2016), http://www.nytimes.com/2016/07/26/technology/amazon-expands-drone-testing-in-britain.html?_r=0. See Popper, supra note 1.